There has been outrage in India after police in Prime Minister Narendra Modi’s home state of Gujarat conducted mock security drills using fake “militants” dressed as Muslims. A video of a drill in Surat district showed police restraining men wearing long tunics and white skullcaps. Another video shot in the Narmada district had the “militants” shouting “Islam Zindabad (Long live Islam)”. Muslim leaders have called the videos “atrocious and highly condemnable”. Critics say the videos stereotype Muslims, who make up nearly 14% of the country’s 1.2 billion population. Stereotyped? Muslims and terrorism? Why I had never made such an association between the two before. 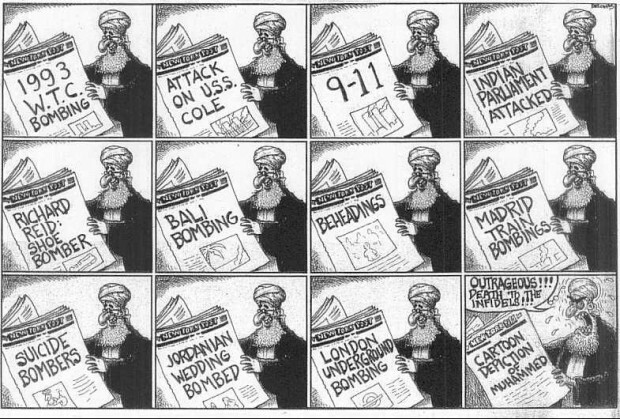 I’ve always ascribed Muslim acts of terrorist violence, the ones we read about every single day non-stop without letup to mental illness.